Zoning enforcement staff from the Department of Regional Planning (DRP) often meet new property owners and real estate agents who are unfamiliar with zoning code regulations. Being uninformed and not asking the right questions can lead to serious problems for buyers. How many units can I have? Does my business need a permit to operate in this zone? These are just a few questions that should be considered before purchasing a property. Since LA County does not have a mandatory inspection program, we do not conduct inspections of properties when they are transferred to a new owner. 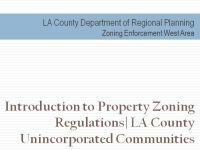 It is important that all real estate agents, prospective property owners and business owners understand the policies and regulations established by DRP before purchasing property in the unincorporated communities of LA County.